TASS-FACTBOX. March 31, 2017. The Sevmash Shipyard in Severodvinsk in northern Russia has floated out the second Project 885 Yasen-class nuclear submarine Kazan. The Project 885 (08850) Yasen-class fourth-generation multipurpose nuclear submarine was developed in the 1990s by the St. Petersburg-based Malakhit Design Bureau of Maritime Machine-Building under the direction of Chief Designer Vladimir Popov. The submarine is based on the Projects 705(K) Lira and 971 Shchuka-B. Sevmash, which is located in Severodvinsk in the Arkhangelsk Region and is part of the United Ship-Building Corporation, is the shipyard engaged in the construction of Yasen-class submarines. The Project 885 Yasen-class submarine is designed to destroy an enemy’s submarines and surface ships, naval bases, ports, naval task forces and other targets. The Yasen-class submarine’s one-and-a-half hull design (the outer hull giving the submarine its streamlined shape is present only in its forepart). According to public sources, the Project 885 submarine is about 139 meters long and about 13 meters wide and has a draft of 10 meters. The submarine displaces 8,600 tonnes in its surface position and up to 13,800 tonnes in its underwater position. It can submerge to a maximum depth of 600 meters and develops a speed of 16 knots in its surface position and up to 31 knots in its underwater position. 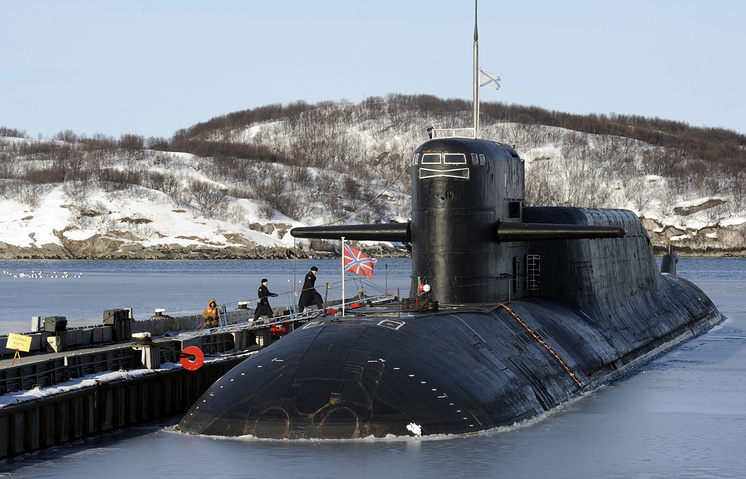 The submarine has a sea endurance of 100 days and a crew of 85-90 men. It is equipped with a single-shaft steam turbine nuclear power unit with a capacity of about 43,000 hp. The submarine’s OK-650V water-cooled and water-moderated reactor has a thermal capacity of 190 MW (modernized Project 885M submarines will be outfitted with a power unit of over 200 MW). The Project 885 submarine is armed with eight vertical silos for Oniks and Kalibr cruise missiles, ten 533mm torpedo tubes with an ammunition load of 30 torpedoes each. Submarines of this type can be eventually armed with new Kh-101 (Kh-102) cruise missiles and universal deep-water homing torpedoes. The Project 885 lead submarine K-560 Severodvinsk (Factory No. 160) was laid down at the Sevmash Shipyard on December 21, 1993, floated out on June 15, 2010, delivered to the Russian Navy for operational evaluation on December 30, 2013 and made operational in the Northern Fleet on June 17, 2014. The other submarines of this series are being built under the modernized Project 885M (08851) Yasen-M. They are characterized by the optimized hull shape and upgraded electronic warfare and automation systems. A contract for the construction of a submarine with Factory No. 161 was signed between Russia’s Defense Ministry and the Sevmash Shipyard on December 6, 2005. The construction of five submarines of this series with Factory Nos. 162-166 is stipulated by a contract of November 9, 2011 concluded with the United Ship-Building Corporation. The second submarine, the K-561 Kazan (Factory No. 161), was laid down on July 24, 2009, floated out on March 31, 2017 and is expected to be delivered to the Russian Navy in 2018. The third submarine, the K-573 Novosibirsk (Factory No. 162), was laid down on July 26, 2013 and is scheduled to be delivered to the Navy in December 2019. 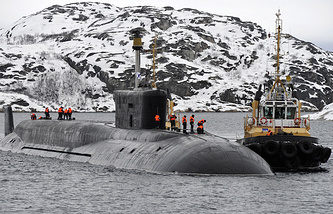 The fourth submarine, the K-571 Krasnoyarsk (Factory No. 163), was laid down on July 27, 2014 and is expected to be delivered to the Navy in December 2020. The fifth submarine, the K-564 Arkhangelsk (Factory No. 164), was laid down on March 19, 2015 and is expected to be delivered to the Navy in December 2021. The sixth submarine Perm (Factory No. 165) was laid down on July 29, 2016 and is expected to be delivered to the Navy in December 2022. The state armament program through 2020 envisages the construction of six Yasen-class submarines. Another underwater cruiser, the Ulyanovsk (Factory No. 166), is expected to be laid down in July 2017 and delivered to the Navy in 2023.